For the Russian footballer, see Mikhail Lazarev (footballer). Admiral Mikhail Petrovich Lazarev (Russian: Михаил Петрович Лазарев, 3 November 1788 – 11 April 1851) was a Russian fleet commander and an explorer. Lazarev was born in Vladimir, a scion of the old Russian nobility from the Vladimir province. In 1800, he enrolled in Russia's Naval College. Three years later he was sent to the British Royal Navy, where he would stay for a continuous five-year navigation. From 1808 to 1813, Lazarev served in the Baltic Fleet. He took part in the Russo-Swedish War of 1808–1809 and Patriotic War of 1812. Lazarev first circumnavigated the globe in 1813–1816, aboard the vessel Suvorov; the expedition began at Kronstadt and reached Alaska. During this voyage, Lazarev discovered the Suvorov Atoll. As a commander of the ship Mirny and Fabian Gottlieb von Bellingshausen's deputy on his world cruise in 1819–1821 (Bellingshausen commanded Vostok), Lazarev took part in the discovery of Antarctica and numerous islands. On 28 January 1820 the expedition discovered the Antarctic mainland, approaching the Antarctic coast at the coordinates 69°21′28″S 2°14′50″W﻿ / ﻿69.35778°S 2.24722°W﻿ / -69.35778; -2.24722 and seeing ice-fields there. In 1822–1825, Lazarev circumnavigated the globe for the third time on his frigate Kreyser, conducting broad research in the fields of meteorology and ethnography. In 1826, Lazarev became commander of the ship Azov, which would sail to the Mediterranean Sea as the flagship of the First Mediterranean Squadron under command of Admiral Login Petrovich Geiden and participated in the Battle of Navarino in 1827. Lazarev received the rank of rear admiral for his excellence during the battle. In 1828–1829, he was in charge of the Dardanelles blockade. In 1830, Lazarev returned to Kronstadt and became a commander of naval units of the Baltic Fleet. Two years later, he was made Chief of Staff of the Black Sea Fleet. In February–June 1833, Lazarev led a Russian squadron to the Bosporus and signed the Treaty of Hünkâr İskelesi with the Ottoman Empire. In 1833, Lazarev was appointed Commander of the Black Sea Fleet, the Black Sea ports, and also military governor of Sevastopol and Nikolayev. Admiral Lazarev was influential both in technical matters and as a mentor to younger officers. He advocated the creation of a steam-powered fleet, but Russia's technical and economical backwardness was a major hindrance to this. He also tutored a number of the Russian fleet commanders, including Pavel Nakhimov, Vladimir Alexeyevich Kornilov, Vladimir Istomin, and Grigory Butakov. An atoll in the Pacific Ocean, capes in the Amur Liman and on the Unimak Island, a former island in the Aral Sea, a bay and a port in the Sea of Japan, bay and sea in the South Ocean, a settlement near Sochi and other locations bear Lazarev's name. A light cruiser ordered for the Imperial Russian Navy in 1914, completed and renamed Krasnyi Kavkaz after the Russian Revolution. Admiral Lazarev was a Sverdlov-class cruiser built in the early 1950s. The Kirov-class battlecruiser Frunze was renamed Admiral Lazarev after the dissolution of the Soviet Union. Lazarev is buried with his disciples Nakhimov, Kornilov and Istomin in the Admirals' Burial Vault in Sevastopol. A minor planet 3660 Lazarev, discovered by Soviet astronomer Nikolai Stepanovich Chernykh in 1978, is named after him. ^ V.V. Rummel, V.V. Golubtsov, Rodoslovnyi sbornik russkikh dvorianskikh familii, vol. 1, Sankt Petersburg, 1886, p. 504. The Russian noble family Lazarevs shall not be confused with the Armenian family Lazariants who russified their surname from Lazariants into Lazarevs. ^ Melvin, Mungo (2017). Sevastopol's Wars: Crimea from Potemkin to Putin. Bloomsbury Publishing. p. 117. ISBN 9781472822277. ^ Schmadel, Lutz D. (2003). Dictionary of Minor Planet Names (5th ed.). New York: Springer Verlag. p. 308. ISBN 3-540-00238-3. Pavel Stepanovich Nakhimov was one of the most famous admirals in Russian naval history, best remembered as the commander of naval and land forces during the Siege of Sevastopol during the Crimean War. Fabian Gottlieb Thaddeus von Bellingshausen, a Baltic German naval officer in the Imperial Russian Navy, cartographer and explorer, who ultimately rose to the rank of admiral. He participated in the First Russian circumnavigation of the globe and subsequently became a leader of another circumnavigation expedition that discovered the continent of Antarctica. Vladimir (Vladislav) Ivanovich Istomin was a Russian rear admiral (1853) and hero of the Siege of Sevastopol. 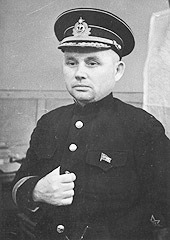 Filipp Sergeyevich Oktyabrskiy was a Soviet naval commander. He began service on the Baltic Fleet in November 1917. From 1925–27 he studied at the Naval Academy in Leningrad. As vice admiral he was given command of the Black Sea Fleet in March 1939 and headed its actions during the Sieges of Sevastopol and Odessa. After the war he was a Deputy Commander-in-Chief of the Navy, commander of all naval test centres and from 1957 to 1960 head of the P.S. Nakhimov Higher Naval School in Sevastopol. The Order of Nakhimov is a military decoration of the Russian Federation named in honour of Russian admiral Pavel Nakhimov (1802–1855) and bestowed to naval officers for outstanding military leadership. The order was established during World War II by decree of the Presidium of the Supreme Soviet of the USSR of March 3, 1944. Following the 1991 dissolution of the USSR, the Order of Nakhimov was retained unchanged by decision of the Supreme Soviet of the Russian Federation № 2424-1 of March 2, 1992 but it was not awarded in this form. The all encompassing Decree of the President of the Russian Federation № 1099 of September 7, 2010 that modernised and reorganised the entire Russian awards system away from its Soviet past amended the Order of Nakhimov to its present form, a ribbon mounted single class Order. Ivan Alexeyevich Shestakov was a Russian naval officer, statesman, and writer. Yevfimiy Vasilyevich Putyatin, also known as Euphimius Putiatin, was an admiral in the Imperial Russian Navy. His diplomatic mission to Japan resulted in the signing of the Treaty of Shimoda in 1855, for which he was made a count. His mission to China in 1858 resulted in the Russian Treaty of Tianjin. Vladimir Afanasyevich Kasatonov was a Soviet military leader, fleet admiral, and Hero of the Soviet Union. Vladimir Sergeyevich Vysotskiy Russian: Владимир Серге́евич Высоцкий, Ukrainian: Володимир Сергійович Висоцький Volodymyr Serhiyovych Vysotskiy; is a Russian admiral and former Commander of the Russian Northern Fleet. On 12 September 2007, Vysotskiy was appointed Commander-in-Chief of the Russian Navy, succeeding Vladimir Masorin who retired at age 60 the same day. Vice Admiral Karl Johann Peter Jessen was a Baltic German admiral in the Imperial Russian Navy during the Russo-Japanese War. Vice Admiral Vladimir Alexeyevich Kornilov was a Russian naval officer who took part in the Crimean War. St. Vladimir's Cathedral is an Orthodox church in Sevastopol which was built in the aftermath of the Crimean War as a memorial to the heroes of the Siege of Sevastopol (1854–1855). Grigory Ivanovich Butakov was a Russian admiral who fought in the Crimean War. Butakov is widely credited as being the father of steam-powered ship tactics during the 19th century. He was involved in the first battles of the Crimean War, which includes the first sea battles involving steam-powered ships. Butakov wrote of his experiences in his book: New Principles of Steamboat Tactics (1863), which won him the Demidov Prize. In 1881 Butakov assumed the role of Commander-in-Chief of the Port of St. Petersburg. He was also made a member of the State Council in March 1882. Shortly after gaining both titles however, Butakov fell seriously ill, and died on the 31 May 1882, aged 62. The minor planet 4936 Butakov was named in his memory. Vostok was a 28-gun sloop-of-war of the Imperial Russian Navy, the lead ship of the First Russian Antarctic Expedition in 1819—1821, during which Fabian Gottlieb von Bellingshausen and Mikhail Lazarev circumnavigated the globe, discovered the continent of Antarctica and twice circumnavigated it, and discovered a number of islands and archipelagos in the Southern Ocean and the Pacific. Mirny was a 20-gun sloop-of-war of the Imperial Russian Navy, the second ship of the First Russian Antarctic Expedition in 1819—1821, during which Fabian Gottlieb von Bellingshausen and Mikhail Lazarev circumnavigated the globe, discovered the continent of Antarctica and twice circumnavigated it, and discovered a number of islands and archipelagos in the Southern Ocean and the Pacific. Johan Eberhard von Schantz, born 29 October 1802 in Pori, died 3 January 1880 in St. Petersburg, was a Finnish-born admiral in the Russian Imperial Navy, ship designer and explorer.